In honor of June being National Men’s Health Month, here’s a recipe that *might* just help get a few more men to like salads! Thank you to Holistic Nutritionist, Elissa Goodman, for combining your two favorite foods into this delicious recipe! With pizza in one hand, warm and saucy with rich cheese and acidic tomatoes brushed over crispy crust. In the other hand salad, crispy and fresh with herbaceous notes and creamy avocado drizzled with rich olive oil and acidic lemon. Can you think of anything more delicious than the two wonderful worlds of pizza and salad meshed together into one big saucy, crunchy, crispy, and fresh bite? Preheat oven to 425. Build your own pizza, spread out sauce and layer toppings (optional, your choice). Dollop with spoonfuls of almond ricotta cheese and finish with a sprinkle of sea salt, oregano, and fresh basil. Place on bottom rack of oven for 14-16 minutes or until golden brown. 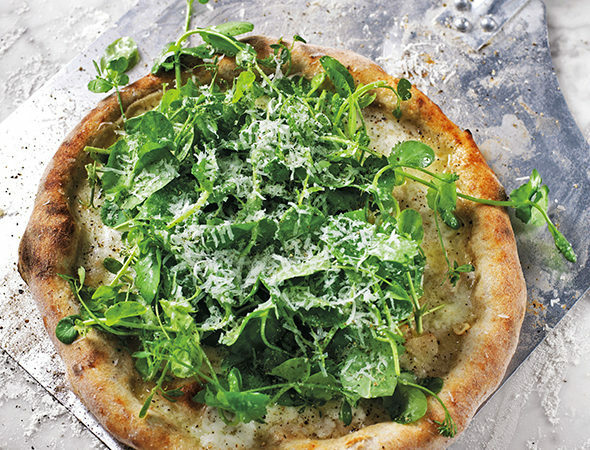 While crust is cooking, place arugula, fennel, lemon juice, olive oil into a large bowl and toss to coat. Remove pizza from oven and immediately top with salad mixture. Finish salad with avocado slices and serve immediately.